air bags for driver and front passenger. These systems are designed to act independently or together when the vehicle is subjected to a frontal impact. 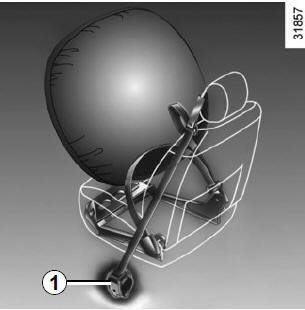 The pretensioners hold the seat belt against the body, holding the occupant more securely against the seat, thus increasing the seat belt’s efficiency. With the ignition on, following a significant frontal impact and depending on the severity of the impact, the system may trigger the seat belt inertia reel pretensioner 1, which instantly retracts the seat belt. Have the entire restraint system checked following an accident. No operation whatsoever is permitted on any part of the system (pretensioners, air bags, computers, wiring) and the system components must not be reused on any other vehicle, even if identical. To avoid incorrect triggering of the system which may cause injury, only qualified personnel from an approved Dealer may work on the pretensioner and air bag system. The electric trigger system may only be tested by a specially trained technician using special equipment. When the vehicle is scrapped, contact an approved Dealer for disposal of the pretensioner and air bag gas generators. Above a certain severity of impact, this mechanism is used to limit the force of the belt against the body so that it is at an acceptable level. Fitted to the driver and passenger side. 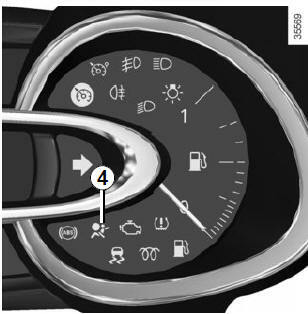 The presence of this equipment is indicated by the word “Air bag” on the steering wheel and dashboard (air bag zone A) and, depending on the vehicle, a symbol on the lower section of the windscreen. light on the instrument panel. The air bag system uses pyrotechnic principles. This explains why, when the air bag inflates, it will generate heat, produce smoke (this does not mean that a fire is about to start) and make a noise upon detonation. In a situation where an air bag is required, it will inflate immediately and this may cause some minor, superficial grazing to the skin or other problems. This system is only operational when the ignition is switched on. In a severe frontal impact, the air bags inflate rapidly, cushioning the impact of the driver’s head and chest against the steering wheel and of the front passenger against the dashboard. The air bags then deflate immediately so that the passengers are not in any way hindered from leaving the vehicle. the instrument panel when the ignition is turned on and then go out after a few seconds. If it does not light up when the ignition is switched on, or comes on when the engine is running, there is a fault in the system. Contact your approved Dealer as soon as possible. Your protection will be reduced until this fault is rectified. All of the warnings below are given so that the air bag is not obstructed in any way when it is inflated and also to prevent the risk of serious injuries caused by items which may be dislodged when the air bag inflates. Do not modify the steering wheel or the steering wheel boss. Do not cover the steering wheel boss under any circumstances. Do not attach any objects (badge, logo, clock, telephone holder, etc.) to the steering wheel boss. The steering wheel must not be removed (except by qualified personnel from our Network). When driving, do not sit too close to the steering wheel. Sit with your arms slightly bent (see the information on “Adjusting your driving position” in Section 1). 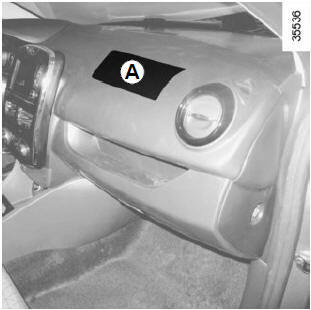 This will allow sufficient space for the air bag to deploy correctly and be fully effective. Do not attach or glue any objects (badge, logo, clock, telephone holder, etc.) to the dashboard on or near the air bag. Do not place anything between the dashboard and the passenger (pet, umbrella, walking stick, parcels, etc.). The passenger must not put his or her feet on the dashboard or seat as there is a risk that serious injuries may occur. In general, parts of the body should be kept away from the dashboard (knees, hands, head, etc.). The devices in addition to the front passenger seat belt should be reactivated as soon as a child seat is removed, to ensure the protection of the passenger in the event of an impact. A REAR-FACING CHILD SEAT MUST NOT BE FITTED TO THE FRONT PASSENGER SEAT UNLESS THE ADDITIONAL RESTRAINT SYSTEMS, I.E. THE PASSENGER AIR BAG, ARE DEACTIVATED.